The Port of NJ and NY played a key role in the containerization of port operations worldwide. 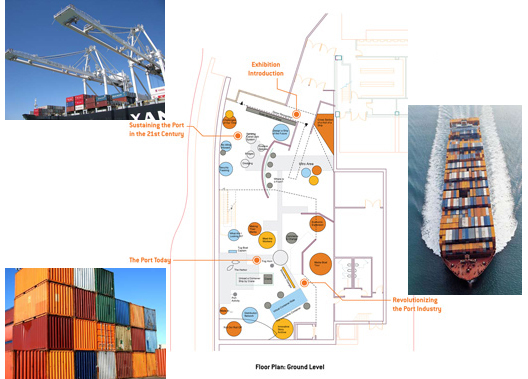 This feasibility study and master planning on the concept of creating a visitor center and exhibition that brings this period of dramatic change and the importance of port operations to the public. A proposed center is to be located at Liberty State Park within view of the Port, the Statue of Liberty and Ellis Island. The proposed opening date is 2013. This exhibition incorporates four themes: Water, Movement, Scale, and Memory. The port environment begins with its most elemental feature - water. Water is the physical network that connects both local and global communities and industries via shipping, and so will water be the central connection for the whole exhibition. The bustling environment and movement of goods are reflected in a design that connotes a dynamic and richly textured visual experience. The 26-foot high ceiling makes it possible to have large-scale exhibits such as breakbulk cargo handling activities, full-body crane simulator, container ride, and a large wall of consumer product diversity. On the ground floor of the exhibition, an impressive scale of crane structures, ship hulls and real artifacts, contrasted against miniature models or human-scale interactivity are theatrically juxtaposed, heightening the port's larger-than-life quality.